Society wedding planner Annabelle Archer is no stranger to wedding day stress, but a dead body at her latest fete takes the cake. When suspicion falls on her best friend and caterer Richard Gerard, she knows she must find the real culprit before his career is ruined along with her reputation for solving problems. But it’s no easy feat since the slain mother-of-the-bride was the most hated socialite in the city. As Annabelle navigates DC’s powerful social scene to unmask the culprit, there’s no telling how many more victims the killer will claim or if Annabelle and her friends will be among them. 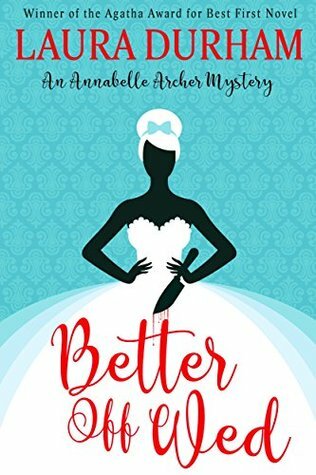 Better Off Wed is the first book in the Annabelle Archer cozy mystery series. If you like charming characters, fast-paced comedy, and behind-the-scenes glimpses into the wild world of weddings, then you’ll love Laura Durham’s Agatha award-winning mystery. Is there anything more comforting for a Friday night read than a cosy mystery with a fun theme? No. No there is not. This is the first book in a series of murder mystery novels, investigated by Annabelle, intrepid wedding planner and her assistant and talented caterer. Anyone brave enough to work alongside brides and their crazy relatives shouldn’t have any problems dealing with murderers and criminals. Annabelle suffers from the standard amateur sleuth lack of common sense and self preservation – she throws herself entirely into investigating the wedding guests and contractors, putting herself in harms way in an entirely charming way. The writing style is friendly and fun, stopping just short of being infuriatingly twee and perky (thank goodness). I did figure out whodunnit fairly early on in the story but it didn’t spoil my enjoyment of it. I told my friend I was reading a murder mystery where the mother of the bride is murdered, with no other details at all, and she immediately called it – so it may be impossible to make it a complete mystery with this formula of story writing but it’s a fun journey all the same! Between this book and Emily Stringer’s ‘The Bride Wore Brains’ , I’ve learnt something about myself – I only like books about weddings when at least one person dies. This is a book I’d recommend for anyone trying to get through the stress of wedding planning or recovering from their big day and the madness that inevitably comes with it. 😂 at needing a person to die!